i Click 'view all' to instantly compare this ok deal with offers on other top foosball tables. 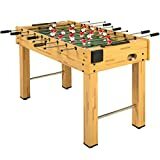 Giantex 27 Foosball Soccer Competition Table Top is currently selling at $39.99, which is its normal price. It has a lowest price of $39.99 and is selling within its usual range. Price volatility is 0.15% (meaning it does not change often), so you might have to wait a while for the price to drop. Until then this is a recommended 'ok deal'. The current deal is also the best price on this item over the last month. 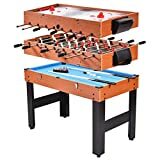 Compare the current price, savings (in dollars & percent) and Buy Ratings for the top Foosball Tables that are closely related to Giantex 27 Foosball Soccer Competition Table Top . Here is how Giantex 27 Foosball Soccer Competition Table Top compares with other leading Foosball Tables. 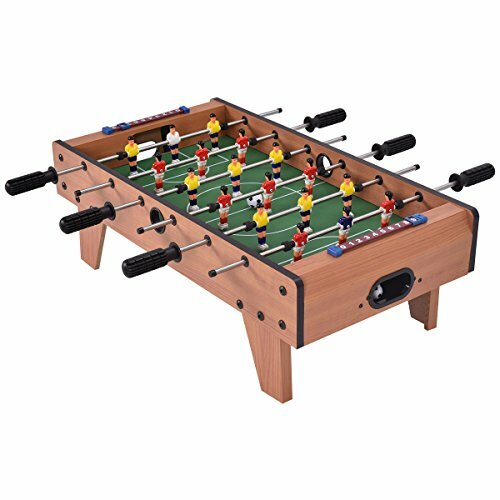 Specification Material: MDF Frame+ Steel Rods Colors Of Polo Shirt: Red & Yellow Overall Dimension: 27" X 15" X 9"(L X W X H) Football Field: 23"X13.5"(L X W) Unit Weight: 12lbs Package Includes: 1 X Foosball (Assemble Is Required) 6x Steel Rods 9x Red Players 9x Yellow Players 2x Footballs 1 X Instruction Features?Portable Design? Giantex durable soccer arcade can fit on top of your kitchen counter, coffee table, or on your floor without leaving scratches. Light enough for easy transport and storage, with guaranteed resilience to withstand the high energy of players. ?Durable Structure?Constructed of strong wood construction and solid steel rods, sturdy and reliable, can serve you for a long time. In addition, 4 leg construction provides additional stability. ?Fun For All Age? Kids and adults will be able to get lots of enjoyment from this versatile and simple-to-use interactive furniture. It will fit in nicely in a game room, garage or playroom to give you a unique entertainment option. ?Easy To Play?6 rows are included within the table to allow 3 rows per team; 9 red players and 9 yellow players. Internal ball retrieval at each goal. Plastic manual slide scorers at each goal.